Main engine: DEUTZ SBA 12 M 816 U. 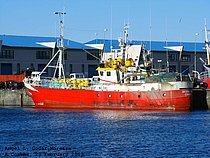 On 9 January 2010, the ORTEGAL UNO, a fishing vessel flying the flag of Germany, left her port of fitting out, A Coruna, which is on Spain's Atlantic coast, to fish off the west of Ireland. The weather deteriorated continuously during the voyage to the fishing grounds and a storm of up to 10 Bft prevailed when these were reached on 12 January 2010. Nevertheless, the crew made preparations to lay the nets. Several large waves suddenly entered the fish processing area and caused the vessel to list about 40° to port. Following that, the ship's command immediately arranged for the life rafts to be made ready and called the ORTEGAL TRES, another of the shipping company's vessels, for assistance. Attempts were also made to ensure the vessel was watertight in order to prevent the ORTEGAL UNO from foundering. At 10301, the vessel was abandoned by all personnel, who were picked up by the ORTEGAL TRES. The two vessels remained together until the ORTEGAL UNO foundered on the evening of the day after, 13 January 2010. Although the weather conditions improved steadily over the course of the day, the ship's commands did not see any possibility for re-boarding the ORTEGAL UNO in order to rescue her. The ORTEGAL TRES then proceeded to A Coruna and arrived there on 16 January 2010.